Every woman needs at least one Louis Vuitton bag in her closet. If you’re unsure what bag will suit you the best, why not start with the Louis Vuitton Monogram Canvas Surene MM bag? It’s one of the newer models from 2018, and it’s absolutely stunning! If you want a luxurious bag that isn’t overdone but has that special detail that makes it stand out, then this is the perfect one for you. It’s embellished with the iconic Monogram Canvas we all love with the addition of cherry-colored calf leather. Moreover, this leather is what makes the bag so durable. Furthermore, this bag is actually a chain tote bag! The gold-color chain adds a certain chicness to the bag. There are actually two chain straps with smooth calf leather shoulder pads which make the chain comfortable and easy to wear. Yet another interesting detail on this chain tote bag is the name tag attached to the eyelet. Not only is this Louis Vuitton tote bag stylish but it’s also surprisingly functional. It’s great for daily use, and you can even take it to work with you since it easily fits an A4 file inside. Also, it has three separate compartments where you can store your belongings, as well as double smartphone pockets. The central compartment has a zippered closure and the two side compartments have magnet closures. The Louis Vuitton Monogram Canvas Surene MM is 36 cm (14.2 in) wide, 26 cm (10.2 in) long, and 12 cm (4.7 in) deep. 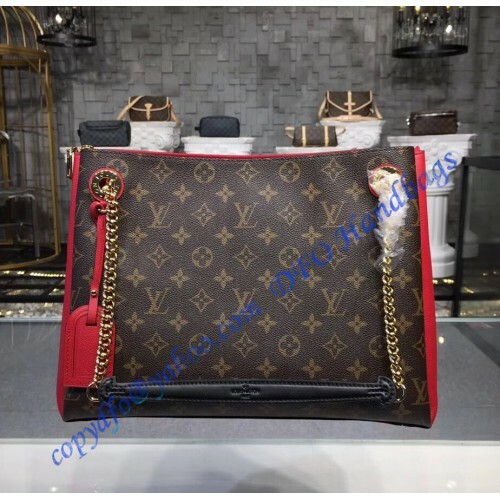 Overall, the Louis Vuitton Surene MM is comfortable, chic, and has a well-organized interior. Basically, it’s every woman’s dream accessory! If you want to buy this Surene MM bag, you can buy it for cheap at $356.00.